Foot pain can range from a mild annoyance to severe, debilitating pain that interferes with your everyday activities. If you experience foot pain, see a doctor as soon as possible. Conditions that cause foot pain can get progressively worse, so seeing a foot specialist in Houston in the early stages of your symptoms could prevent them from intensifying. Many different conditions can cause foot pain. Here is a closer look at some of the most common causes diagnosed by foot doctors. Many different types of arthritis, from gout to rheumatoid arthritis, can cause foot pain. Osteoarthritis, one of the most common forms of the disease, occurs when wear and tear damages the joints. Because the feet carry all of your weight, they are extremely vulnerable to this kind of arthritis. Your foot doctor will determine which type of arthritis is affecting your feet by considering your symptoms, using diagnostic imaging tests, and ordering blood work. Once the cause is diagnosed, your foot specialist can begin the appropriate treatment. A bunion is a lump that grows at the joint at the bottom of your big toe. Over time, the bunion can cause your big toe to bend against the neighboring toe, and as it grows bigger, it can become tender and red. When left untreated, bunions can become quite painful and make it difficult to find shoes that fit over the protrusion. In early stages, conservative treatment, including medications and shoe inserts, can alleviate bunion pain. When this doesn’t work, bunion surgery may be necessary. Diabetes can lead to damage to the nerve fibers, particularly in the extremities. Although neuropathy can happen to anyone with diabetes, it is much more common in people with poorly controlled blood glucose levels. Neuropathy can lead to disabling pain and numbness in the feet. Because of the numbness, people with neuropathy can injure their feet without realizing it, which can allow a dangerous infection to occur that could lead to amputation. People with diabetes should examine their feet daily and see a foot doctor regularly. Morton’s neuroma is a very painful foot condition that affects the ball of your foot. It is caused by a thickening of the tissue around one of your toe’s nerves. Symptoms include a burning pain in the ball of your foot that radiates into your toes, tingling and numbness in your toes, and the feeling of standing on a pebble or rock in your shoes. The condition can be diagnosed and treated by a foot doctor or foot specialist in Sugar Land . Watch this informative video for more information about Morton’s neuroma. Orthopedic surgeon Dr. Tracy Pesut reviews the causes, symptoms, and treatment options for the disorder. A podiatrist near you can perform diagnostic tests or discuss certain risk factors of Morton’s neuroma with you. Arthritis is a chronic disorder that can affect any joint in the body, including feet and ankles. The majority of people who are diagnosed with rheumatoid arthritis will develop foot and ankle problems during the course of the disease. If you suffer from rheumatoid arthritis, you should visit a podiatrist or foot and ankle specialist near Sugar Land for treatment that may slow the progression of the disease. The primary symptoms of rheumatoid arthritis in the foot or ankle are pain, swelling, inflammation, and stiffness of the joint. These symptoms typically occur in both feet at once, and affect the same joints in each foot. Early indications of arthritis in the ankle include increased difficulty walking up ramps and stairs. As the disease progresses, walking and standing can also become painful and difficult. Early indications of arthritis in the foot include difficulty walking on uneven ground, flat feet, bone spurs, and bunions. Rheumatoid arthritis has no cure, but a foot and ankle specialist or podiatrist near you can provide a variety of treatment options that may ease your symptoms. These treatments may include medication, rest, physical therapy, orthotics, and steroid injections. 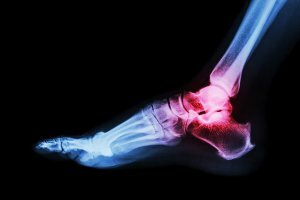 You will typically have a treatment team of foot and ankle specialists that consists of a rheumatologist, physical and occupational therapist, an orthopedic surgeon, and a rehabilitation specialist. Your foot and ankle specialist will recommend foot surgery if non-surgical options have proven unsuccessful, or if you have extensive cartilage damage. Surgical treatment typically involves a surgical procedure called fusion, during which two bones that form a joint are fused together to create one bone. During the healing process, a new bone will grow between the two fused joint bones. This surgery limits joint motion, which reduces the pain caused by rheumatoid arthritis. It is particularly effective for the ankle joint, as that tends to be the most painful joint when affected by arthritis. A bunion is a foot deformity that causes one of the bones of the big toe to become enlarged and dominant against the outer edge of the toe. The deformity looks like a large bump, and it is made up of bone and soft tissue. 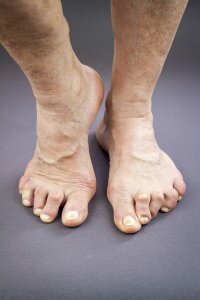 Bunions can develop as a result of certain diseases, such as arthritis or polio, or regularly wearing ill-fitting shoes. If you’re in need of bunion treatment in Sugar Land , a podiatrist or foot specialist near you may recommend bunion surgery. Here are some important facts about bunion surgery. 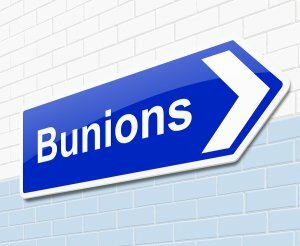 Who Can Benefit from Bunion Surgery? Your podiatrist or foot doctor will recommend bunion surgery if all other non-surgical bunion treatment options have failed. The surgery is typically recommended for those who suffer from these symptoms as a result of their bunions: intense pain, difficulty walking, chronic inflammation, and toe stiffness and deformity. The main goal of bunion surgery is to realign the joint, correct a deformity, and relieve pain. A foot specialist may choose from a few different procedures to accomplish this. Osteotomy is a type of surgery in which the joint bone is cut or realigned to correct deformity or relieve pressure on the joint. Arthrodesis is the removal of damaged joint areas, and the insertion of screws, wires, or plates to hold the joint together. Your surgeon may also need to repair the tendons and ligaments around your big toe to add structure, flexibility, and strength. The majority of patients who visit a podiatrist or foot specialist for bunion removal surgery report a dramatic decrease in pain and in the severity of their toe deformity after the surgery. Bunion surgery will not allow you to wear smaller, narrower shoes, and you should not continue to wear these shoes after surgery because it can cause your bunions to reoccur. 85% to 90% of patients who undergo bunion surgery are satisfied with the results. The symptoms of bunions include a visible bump on the outer edge of your big toe, swelling, pain, and inflammation around the big toe, persistent pain, and difficulty in moving the toe. A podiatrist or foot specialist near you can offer you a diagnosis and treatment options if you believe that you’re in need of bunion treatment in Sugar Land . Your foot doctor will first recommend non-surgical bunion treatments, such as a prescription or over the counter mediation for pain, and a medication that can reduce the swelling around your big toe. He may also suggest that you use a heating pad or ice pack to relieve you of pain and swelling. You should also wear comfortable shoes that fit correctly to relieve pain and prevent new bunions from forming. If non-surgical bunion treatment options are unsuccessful, or if you have severe bunions, your podiatrist may recommend bunion surgery. Bunion removal surgery, also called a bunionectomy, is performed in a hospital or foot surgery center. It can be done as an outpatient procedure, under either local or general anesthesia.